In Philadelphia, the Seven Deadly Sins are in flight and preparing to assist in the destruction of the modern world. They are acting on orders given by Black Adam. Doctor Sivana runs after them but cannot keep up, saying the magic is too much for him. Picking up from last issue, we see that Shazam is squared off against Black Adam, who is clutching Mary and Freddy by the throats. Despite the danger, the siblings have a sense of awe about Billy's transformation. Black Adam asserts that Billy Batson cares for his siblings. He says this in a threatening way, as if this is a weakness. Billy's foster parents, Rosa and Victor, are upset that the kids are missing. They call the police for help. Their neighbor, the evil Mr. Bryer, grabs the police officer and demands that Billy be arrested, alleging that Billy harassed his sons and destroyed his car. At that moment, Pride, one of the Seven Deadly Sins, hits Mr. Bryer with an energy blast. She claims they have found their host. Black Adam says that the host will burn the city to cinders. Mr. Bryer is transformed into a fire-breathing demon, and goes on a rampage. Black Adam demands that Billy should give him his power. He squeezes Freddy's throat tighter. Billy agrees; but then he sees the image of mystical Francesca in a pool of water. She reminds him of a secret spell the Wizard gave him. Billy utters that spell. When he calls forth the magic lightning, it gives the power to Billy's siblings, not to Black Adam. So Mary, Freddy, Pedro, Eugene, and Darla are suddenly transformed just like Billy has been. When Shazam gives the word, they all attack Black Adam in unison. As a struggle ensues, Black Adam gets his hands on Darla's throat. But then Billy and Mary combine forces to punch Black Adam and send him flying, freeing Darla. Eugene discovers that he can now command electronic devices and request their help. Billy asks Mary and the others to protect citizens from the fire demon. Billy says he will confront Black Adam alone. As the other siblings help bystanders get to safety, Mary confronts the fire beast and lands a hard right, staggering the demon. As Shazam and Black Adam face off, Tawny the tiger jumps in to protect Billy and gets smacked by Black Adam. 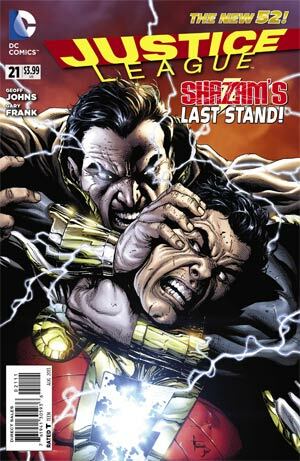 Shazam uses the magic lightning to share some power with Tawny, who then retaliates against Black Adam. Suddenly, the heroes all become weaker, as their powers begin to fade. 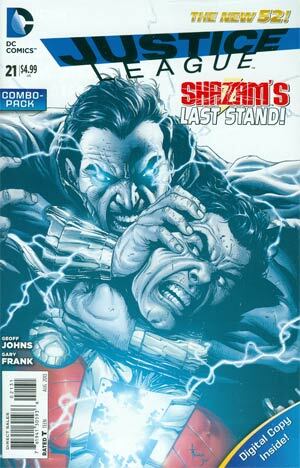 Shazam and Black Adam continue to grapple. Black Adam says that Shazam is responsible for weakening the others due to his inexperience with the magic. Billy talks Black Adam into saying the magic word and transforming into his mortal self, so that he and Billy can have a fair fight without magic. But Black Adam has been alive for centuries, and has not assumed his mortal form in many years. So when he switches back now, his body shows its age; and he begins to disintegrate and crumble into dust. Francesca indicates that Black Adam is now dead. She urges Billy to switch back to Shazam and frighten the Seven Deadly Sins away. Billy complies and transforms back into the mighty Shazam. The Seven Deadly Sins emerge from the fiery jaws of the demon. The demon loses his mojo and switches back to Mr. Bryer. After his transformation, Mr. Bryer is naked, and the siblings laugh at him. Several of the bystanders express their approval that Shazam has stopped two robberies and made the monsters go away. Francesca approvingly says that Magic has its champion again. Since she speaks from the surface of a pool of water, it seems clear that nobody but Shazam can see or hear her. We switch to a new day. We see Darla waking Billy from a sound sleep. It is Christmas Day, and Darla is very excited to get downstairs to the Christmas tree, the gifts, and the celebration. Billy's family shouts "Merry Christmas" when he arrives at the bottom of the staircase. It is clear that Billy has gotten past the rebellion stage and now loves his new family. When his stepmom asks if Billy plans to stay with them, Billy makes it clear he is right where he wants to be. In New York, Doctor Sivana attempts to find and traverse the entrance to the Rock of Eternity. He is unable to cross over. But Mr. Mind, a talking caterpillar, says that he has been watching Doctor Sivana all along; and that they will soon be the best of friends. Story - 4: This is a worthy conclusion to a story has been building slowly for over a year. We finally get to see the epic confrontation between Shazam and Black Adam. In my review of last issue, as Billy's siblings struggled in the clutches of Black Adam, I guessed that Mary and Freddy would get their powers from the magic lightning and thus escape from this death grip in the nick of time. Geoff Johns had the same idea; as this is exactly what happened. Since Captain Marvel is now called Shazam, I wonder what the new names will be for Mary Marvel and Captain Marvel Jr.
We have watched Billy's personality evolve slowly as he has gone through the life-changing situations in this retelling of his origin story. I am happy so see that Billy has gotten past the bratty stage. In this issue, for the first time in this series, Billy has shown compassion and unselfishness, and has earned the right to be called a hero. I am also happy to see that Billy has bonded with his new family. Victor and Rosa Vasquez seem like wonderful parents to me. I am glad that Billy has finally figured out that he loves his new family and is grateful for his new home. Shazam was really overmatched in his battle with Black Adam, due to his lack of experience. But he managed to pull off a stunning victory using a clever trick. He appealed to Black Adam's massive ego, and cajoled him into fighting Billy in his human form. Once Black Adam made the switch, he realized immediately that he had made a critical error. But in a stunning scene, his body actually falls apart due to age before he can say the magic word to transform back. We see him actually turning to dust in front of our eyes, no longer able to hurt anyone. This is a fitting end to a despicable villain. But in the DC universe, death is often temporary. Something tells me we have not seen the last of Black Adam. I had a sense of irony about this book. The title on the cover says, "Justice League," but there is no Justice League to be found anywhere inside. I had predicted that this might be the book where the Shazam narrative and the Justice League narrative actually intersect; but that did not happen. 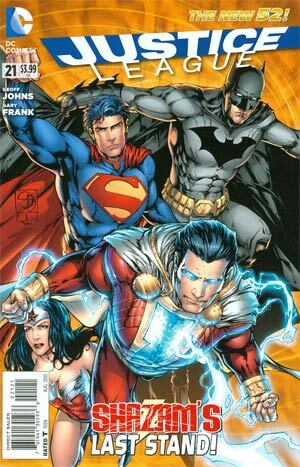 My intuition tells me that the first meeting of Shazam and the Justice League in New 52 continuity will happen soon. The last page says, "The beginning"; so I fully expect that DC will announce a new Shazam comic book at some point. I look forward to seeing this happen. Assuming that DC will be removing Shazam from the pages of Justice League, I am wondering if a new backup series will take its place. If that is the intention, I would like to see a new backup feature with stories that highlight a couple of Justice League members each issue; working together in pairs or perhaps interacting in their civilian identities. Art - 5: Gary Frank has produced some great images in this issue. I love the two-page splash when we see Billy's siblings transformed for the first time. Also, the splash page showing Shazam and Black Adam grappling, and the one showing Mary punching the fire demon, are both excellent. 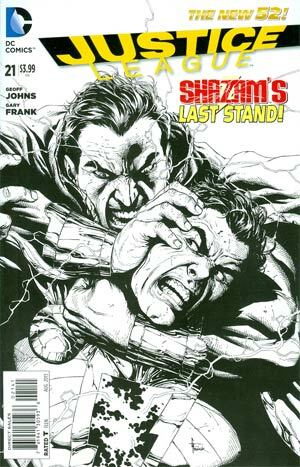 Cover Art - 5: Black Adam and Shazam grapple in what appears to be a fight to the death. They are each driven by fierce determination. There is much implied movement, and lots of emotion, captured in this image. This is a simple but excellent cover! Cover Art (Variant Edition) - 2: By comparison, this cover is kind of bland. There is no emotion whatsoever. Just blank expressions. The original cover is everything that this cover is not!